I must admit, I am not big on Middle Eastern food. Shish this, or shish that, never really catches my fancy unless it is skewered meat that tastes out of this world.. and then some. So, when Cheryl, the Director of Communications of Mandarin Oriental called me to come over to check out their new, contemporary Arabian-style lounge with a menu of inventive mezze and tapas, fashioned after modern Mediterranean cuisine with South African, Spanish and Moroccan influences, I figured, why not? Here’s a good chance to see if they can convert a disinterested diner into a fan. Instead of saying Tabouleh, perhaps I will be saying *Boleh by the end of the night. Anway, Casbah literally translates to “castle” or “palace” and we entered the dark, dark palace to see what feast they had laid out for us that evening. Taking a look at the menu, I think we really should call the type of cuisine served here, “Middleterranean”—a hybrid of Middle Eastern and Mediterranean that makes room for global ingredients.. Yes, this was going to be an interesting night. Oh yeah, we are off to a good start. 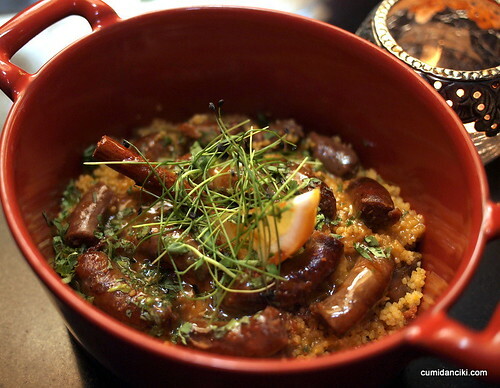 If you like your breads, you will have a field day at Casbah. You can gobble the freshly baked puffy house flatbread whole, or dip it in a bowl of tzatziki, or enjoy it in tandem with any one of numerous, inventive varieties of mezzeh. Flat triangular fried turnover appetizers made from pita bread, are irresistible, surprisingly light and crisp, whether filled with spiced ground meats or mashed potatoes; the sames goes for triangular crispy layers of phyllo that envelope spinach with feta cheese. The meats on the shish kebabs are served slightly charred on the outside, moist and flavorful inside, and are nicely accompanied by a small plate of sauteed vegetables and pillowy pitas. The Albondigas meatballs, in a starchy onion sauce are luscious in flavour and bursting with meaty texture. I liked these a lot. Of special mention is the Tabouleh. These salad leaves are essentially your parsley-filled tabouleh, soaked in just the right ratio of lemon juice and olive oil. Scrumptious. 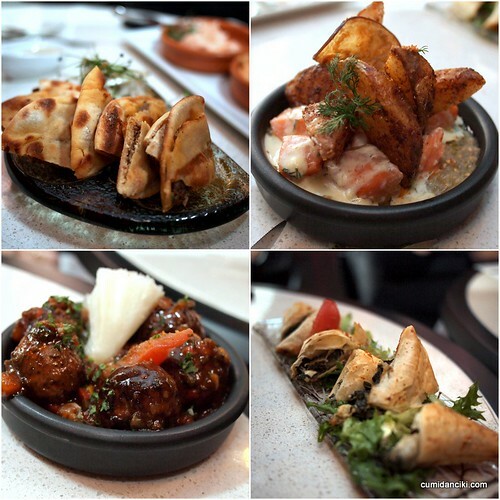 All these amazing dishes are the creations of Moroccan chef , Chef Mustapha Benhadou, who heads the kitchen at Casbah. 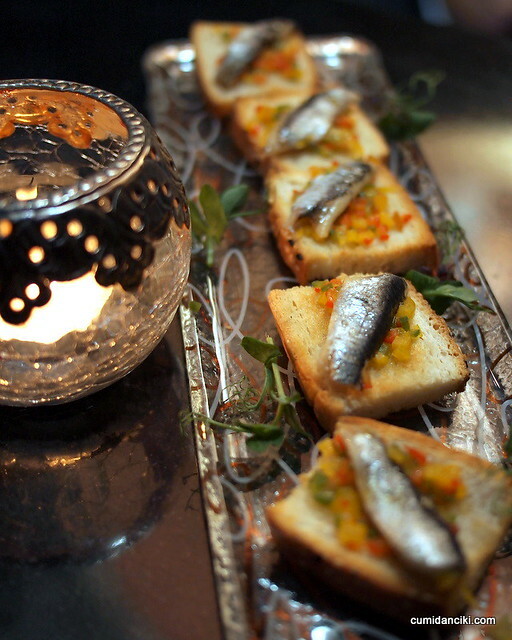 Boquerones are small, fresh anchovies. 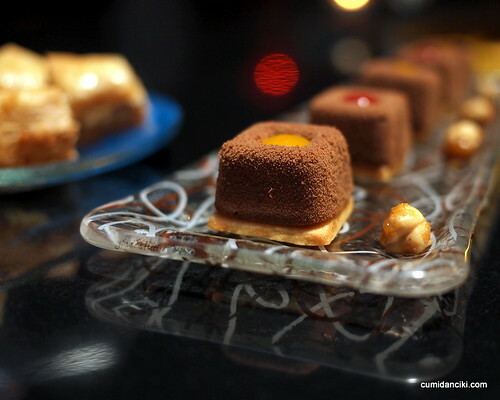 Accompanied by crisp, fresh bread and a glass of delicious red wine they are a delight to eat. Moreover, as with many traditional Spanish dishes which comprise the renowned Mediterranean diet, they are extremely healthy. Tasty and healthy -it does not get any better than this. Incidentally, Casbah does delicious cocktails. Delicious but very sweet. This is the Magic MO’kool Berry Bliss! 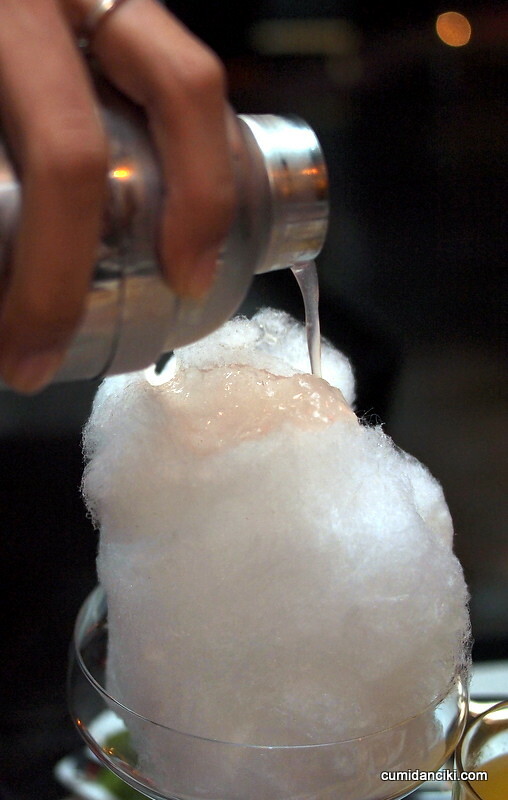 Something that looks like candyfloss, is almost just as sweet and three times as potent as any other cocktail! Drink this if you want to get wasted, fast. The more substantial lamb tagine is served towards the end of the meal. This dish cooked and served in the namesake cooking vessel, with its distinctive conical top, is definitely a great way to end the night. It had a restrained honeyed sweetness that came from the apricots and an accompanying ultra-light cous cous that really worked its magic. I don’t like rice, but I love cous cous. And this, was one gorgeous cous cous. Beware those who do not like gamy lamb, because this dish can come across a little too strong, for those who have a more gentle palate. I love Baklava. I love sinking my teeth into layers of well sweetened phyllo pastry, that just fall apart, revealing the nuts and crunchy bits inside. 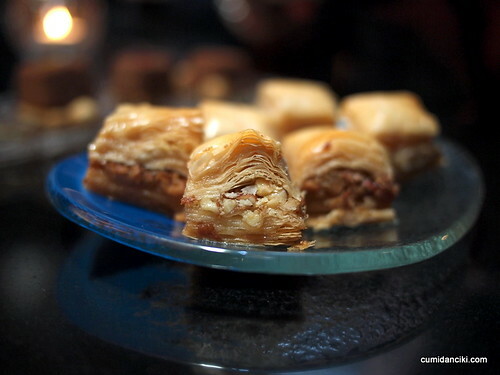 This Baklava was more buttery and solid, not so much flaky. Not the best I have tried but nice enough. 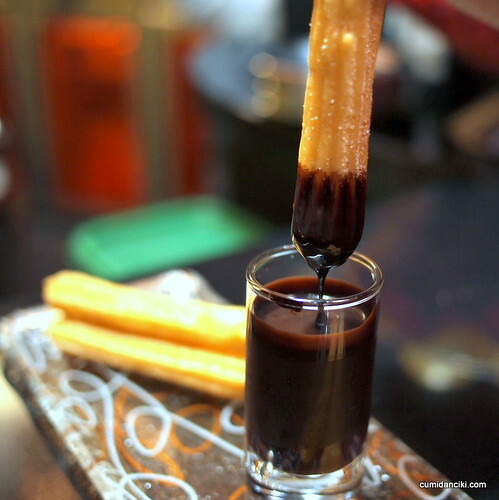 End the night by dipping your Churros into some hot and spicy chocolate, pulling it out and saying, Oh, What a Good boy (or girl), am I! The food served at at Casbah is delightful. I think the fact that it’s more “Middleterranean” than just plain Middle Eastern, changes it up and makes it much more interesting. ohhh cheryl moved to MO?? I dont fancy the shish this and that either..give me real unprocessed meat anytime! 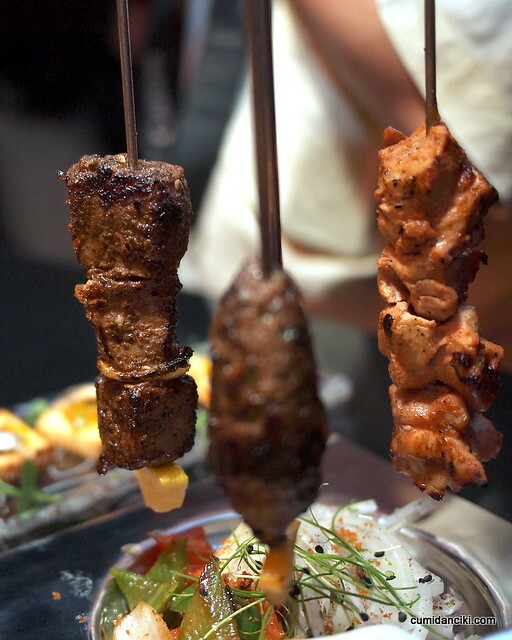 Most shish-es and kebabs are marinated fresh meat. The beef skewer and shish tawook should be chunks of beef and chicken. Lamb kofta would be minced lamb. Frozen hotdogs, nuggets and burgets are examples of processed meats. Wow- I would go here, if only to sample that cotton candy drink! Is it super sugary? Do you eat it like food or does the fluff dissolve in the alcohol? I am fascinated! 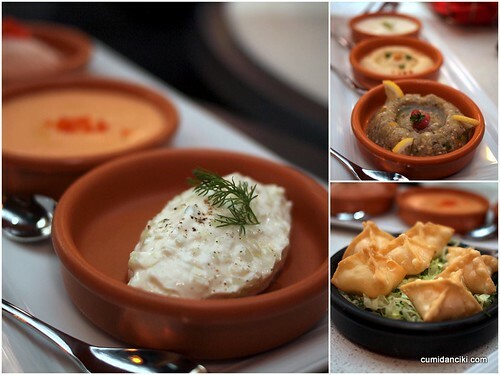 Don’t think I’ve ever tried proper Mid Eastern food – I guess Casbah is a good place to go! well, go the Casbah then! P.S. Them anchovies on the pieces of bread look gnarly yums, hehe. 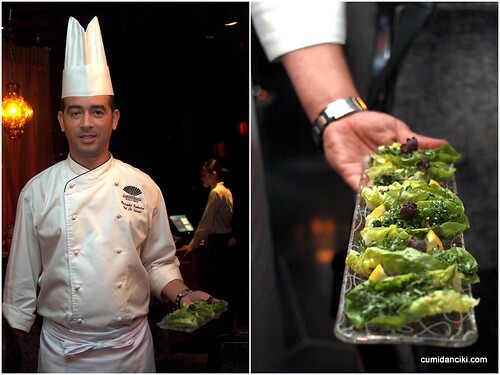 Wd like to try the salad…Tabouleh! I love Middle Eastern/Med cuisine – there’s so much flavour and it feels so healthy! 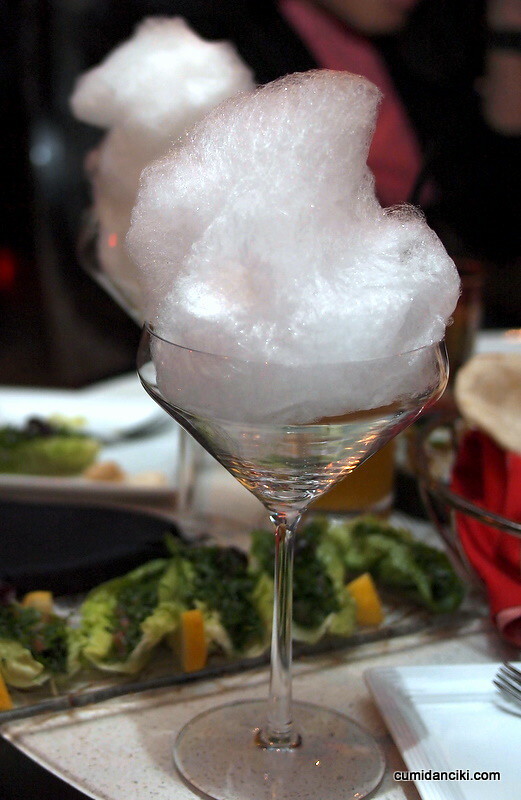 And I bet that candy floss cocktail will make me feel even healthier! really, I’m surprised sean! i thought you LOVED hummus!! You kept going back to the place right.. and I though I saw hummus on your blog many times.. i must be dreaming.. I would love to rock the Casbah. can u please review it on my blog HAHAHA! i know u eat everything dave! !